BCA's Coppelia a Pure Delight! 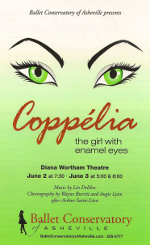 The Diana Wortham Theatre was packed for three straight shows as BCA presented the delightful ballet, "Coppelia". Featuring Sarah London, Miles Sollars-White, Chris Lynn and talented dancers from BCA's Pre-professional division, this comic ballet told the wonderful story of a girl and boy who fall in love, a mysterious toy maker and a magical toyshop. Download the Coppelia 2011 program. In a small European town several hundred years ago, a lovely young girl, Coppelia, is reading a book in the balcony of the strange Dr. Coppelius� toyshop. Swanhilda, a beautiful village maiden, tries to attract her attention, but to no avail. Her friends enter and also try without success. Franz, Swanhilda's boyfriend, thinking he�s alone enters and blows Coppelia a kiss. Swanhilda sees this and becomes furious with Franz. Everyone leaves as the village girls dance a lively mazurka. The Mayor � with entourage � enters and says he will provide gold dowries to all couples who marry. Asked if she will marry Franz, the pouting Swanhilda puts a sheaf of corn to her ear. As legend goes, the corn will tell her if he is faithful or not. Sadly, ear is silent. Swanhilda�s friends dance as do the village children. Dr. Coppelius comes out and is immediately swirled away by a boisterous band of boys and drops his key. Swanhilda and her friends find the key, give way to curiosity, and enter the strange toyshop. Franz � determined to meet Coppelia � finds a ladder and enters the toyshop from above. Swanhilda and her friends enter the wonderful, mysterious toyshop of Dr. Coppelius and begin playing with the life-size dolls. A furious Dr. Coppelius enters and the culprits flee, except Swanhilda, who runs into Coppelia�s alcove. Dr. Coppelius discovers Franz as he enters through the window. Franz explains that he loves Coppelia, but Dr. Coppelius has a better idea: He gets the boy drunk on a secret potion in order to use his Life-force to bring his dolls to life. When the unsuspecting Franz passes out, Dr. Coppelius brings what he thinks is Coppelia from her alcove. However, Swanhilda has changed places with the doll. The deluded Dr. Coppelius believes his beloved has come to life. Swanhilda dances then begins upsetting the toyshop. Dr. Coppelius tries to calm her by commanding his Spanish and Scottish dolls to dance. Swanhilda then reveals the hoax, awakens Franz and they both flee from the toyshop. The act closes as Dr. Coppelius weeps over his Coppelia. Franz and Swanhilda enter the village in a glorious wedding cart. The Mayor is ready to give them their gold dowry as Dr. Coppelius storms in, accusing the couple of destroying his workshop. Swanhilda and Franz, realizing their wrong-doing, offer him her dowry. But the Mayor won�t allow it: Sympathetic to the couple, he gives Dr. Coppelius not one but two bags of gold for his trouble. Dr. Coppelius is satisfied, wishes the couple well, and goes off. The townspeople then sit back and enjoy a festivity of dances, including the Clock Waltz, a dance celebrating Dawn, a Prayer dance, and the Wedding dance. The ballet closes with a delightful finale. ==> Young Village girls – Sarah Adams, Acacia Dayton, Lily Mae Dickinson, Katie Foley, Ruthee Jester, Abegael Johnson, Gabriela Jones, Paige Kemper, Darcey Lynn, Jessica Lynn, Gracie Leonor-Spears, Ira Moul, Catherine Roberts, Kayla Schmitt, Chloe Singleton. ==> Young Village boys – Andrew Blankinship, Harry Cory, Marshall Dayton, Clark Eselgroth, Alex Harkness, Jack Hayes, MezzMyrh O'Neal.